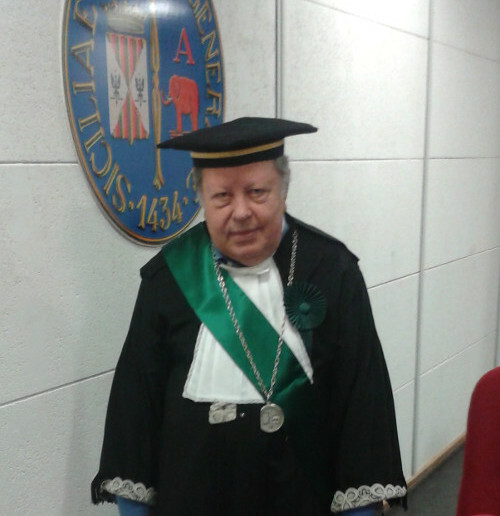 Renato Pucci has been nominated Emeritus Professor | Department of Physics and Astronomy "E. Majorana"
By decree of the Italian Ministry of Education, University, and Research, Renato Pucci has been awarded the title of Emeritus Professor. Born in 1946, Renato Pucci has been Full Professor of Condensed Matter Physics at the Department of Physics and Astronomy #DFA until 2016. During his long academic career, Professor Pucci has served in various roles, such as Director of the Department, member of the Administrative Board of the University of Catania, and Dean of the Faculty of Sciences (twice in that role). From the scientific point of view, Professor Pucci has given contributions to the theory of many-body systems at high pressures and reduced dimensionality, to the theory of surfaces, to the theoretical chemistry of several molecular systems, to superconductors, and to graphene. He is authors of more than 150 papers, and serves as referee of several international journals. Professor Pucci has enjoyed several collaborations, including those with Professors N. H. March (Oxford University), R. G. Parr (North Carolina University), F. Flores (Madrid), A. A. Eremko (Kiev), and V. Yarunin (Moscow), among the others. In molecular physics, quite well-known are the so-called Yang-Parr-Pucci formulae. Professor Pucci has organized several international conferences, including two Archimedes Workshops on high pressure science (1985, 1990), the 36th EHPRG Meeting (1998), the Joint 21st AIRAPT and 45th EHPRG International Conference on High Pressure Science and Technology. (2007: about 500 participants, from every continent), the 91st National Congress of the Italian Physical Society (2005, World Year of Physics, #wyp2005 : about 600 participants). Professor Pucci has served and currently serves as member of the scientific committees of several international associations, such as the European High Pressure Research Group (EHPRG) and the Association Internationale pour l'Avancement de la Recherche et de la Technologie aux Hautes Pressions (AIRAPT). He is Socio Effettivo (Regular Member) of the Accademia Gioenia di Catania.